A few times a week we receive guests who come for the day, either for Polo Day or Day in the Countryside. (Soon we are getting more Norwegians, yay!) 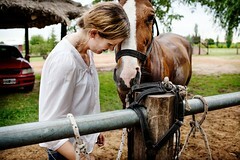 The guests come to enjoy the horses and a nice relaxing day away from the hustle and bustle of the city. I, however, do it the other way around – on my day off, I sometimes head to Buenos Aires for a Day in the City. That involves a selection of what the city offer – restaurants, shopping, friends, going to the salon, partying, dancing, walking and watching the life of the city. On Friday, I had a Day in the City, which started with shopping and ended with a delicious dinner and a night in a hotel. It was the first time I stayed in a hotel since I started working here and I felt a special bond with the people working there! I am happy to say that I have always been a respectful and easy hotel guest (the kind who is embarrassed to leave an untidy room) and I now have even more respect for these people. This was a large hotel and in a way they have it harder – I think that people who come to our estancia treat it with a certain amount of respect because it does feel sort of like a home. In a large hotel, there is less of a personal connection and unfortunately people are not always as respectful. 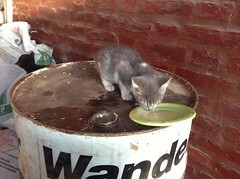 This entry was posted in Buenos Aires, Personal. Bookmark the permalink. 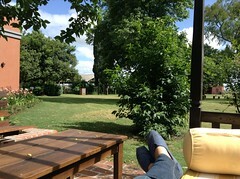 It sounds like life is good on the Estancia. Glad that all is going well and that you are enjoying. Nothing like a night on the town!